The snows of the past week have brought the snow pack in Washington State to near normal (see graphic), and substantial improvements have occurred in Oregon, although they are still dry. But the big weather story of the next few days will be substantial precipitation hitting southern California, with the potential for slides and slope failures, particularly in locations that experienced wildfires last year. Here is the WRF forecast from a sister prediction effort (CANSAC) for the 72 h period ending at 4 PM on Sunday. Some of the mountainous areas inland from Los Angeles may get 5-10 inches, with substantial totals in the central and southern Sierra Nevada. The UW WRF 12-km forecasts for the same period is consistent with 2-5 inches in the northern Sierra and moderate totals spreading as far north as central Oregon. This pulse of heavy precipitation is associated with an unusually intense low pressure center moving in from off the Pacific (see surface chart for 4 PM Friday). You don't see a 978 hPa low pressure center very often that far south in the eastern Pacific. 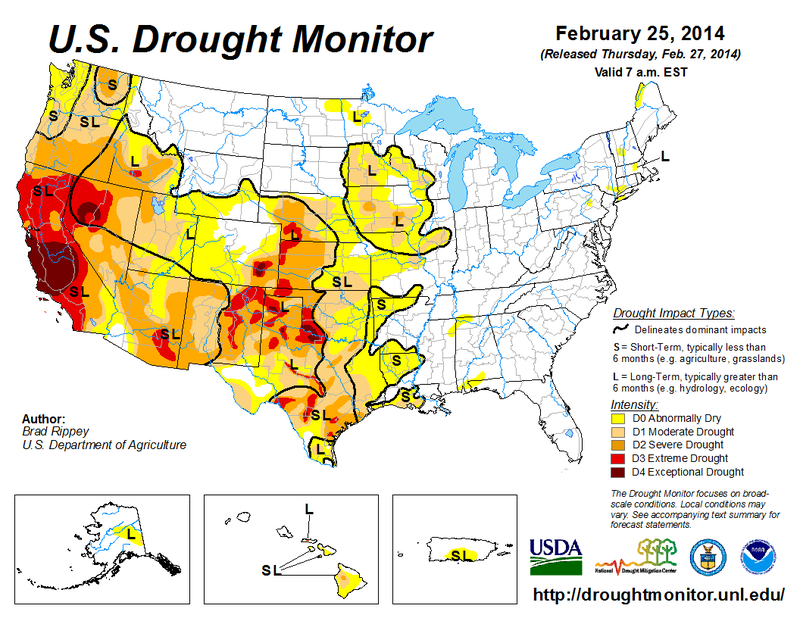 Although substantial precipitation will fall, it will provide only modest relief from the severe drought over California (see graphic) and the latest forecasts suggest that focus of most storms will move northward next week. Oregon has a real chance of moving up to near-normal snow pack before the next few weeks are over. Where is the National Weather Service's New Supercomputer? It is nearly a year since the U.S. Congress supplied the money for a new cutting-edge National Weather Service weather supercomputer, using Superstorm Sandy supplemental funds. The computer promised to greatly improve weather prediction in the U.S. and was cited as a "game changer" by the head of the National Weather Service. It offered the U.S. a chance to finally catch up with or exceed the state-of-the-art predictions of the European Center, resulting in saved lives, improved warnings, and large economic benefits for the United States. Now a year later, the computer has not even been ordered, while the the European Center has just secured a brand-new American computer to push the envelope of weather prediction far beyond that practiced in the U.S. This blog describes this situation and calls on Congress and others to demand immediate remedy of this sad state of affairs. 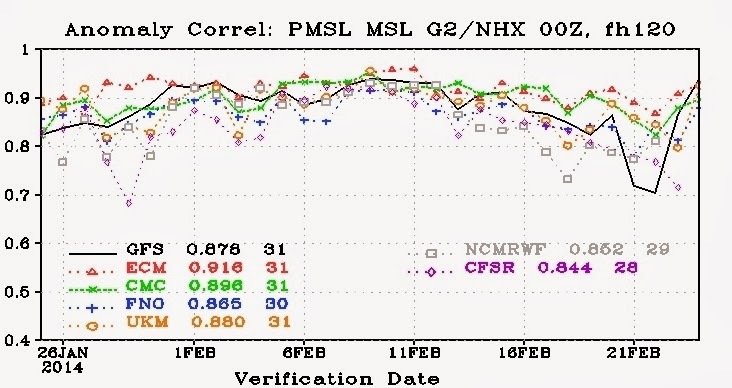 A verification of the five days forecasts for sea level pressure over the northern hemisphere reveals that the National Weather Service global model (the GFS) is in fourth place, behind the European Center (ECM), the UK Met Office (UKM), and the Canadian Met. Center (CMC). The higher the numbers the better (1 is a perfect forecast). Note the consistent high numbers for the ECM, (red dashed) with some major dropouts (e.g., Feb 22) for the US GFS model (black line). European Center for Medium Range Weather Forecasting and the UKMET office consistently outperforming the U.S. operational numerical weather prediction center (the National Weather Service's Environmental Modeling Center, EMC). Lately, the Canadian Meteorological Center has been superior as well. As shown inthe above figure, the U.S. would not even get the bronze medal in weather prediction. This inferiority was made clear to the general population during the period before Superstorm Sandy's landfall, when the U.S. models took several days to come into line with the highly accurate 6-8 day forecasts of the European Center model (discussed in my previous blogs here and here). More seriously, U.S. weakness in numerical prediction is not limited to global modeling: for example, we are failing to run high-resolution ensemble forecasts that would allow far better prediction of severe thunderstorms and other local weather features. As noted by many, including NWS Environmental Modeling Center staff, a major reason why the U.S. lags in numerical weather prediction is the lack of computer resources available to the National Weather Service. Today, the National Weather Service has two computers with peak performance of approximately 210 teraflops and 10,240 processors (Note: 1 petaflop equals 1000 teraflop, a teraflop is a trillion operations per second). This US computer recently was upgraded from 80 to 210 teraflops, with a change in computer architecture from IBM proprietary to commodity chips. 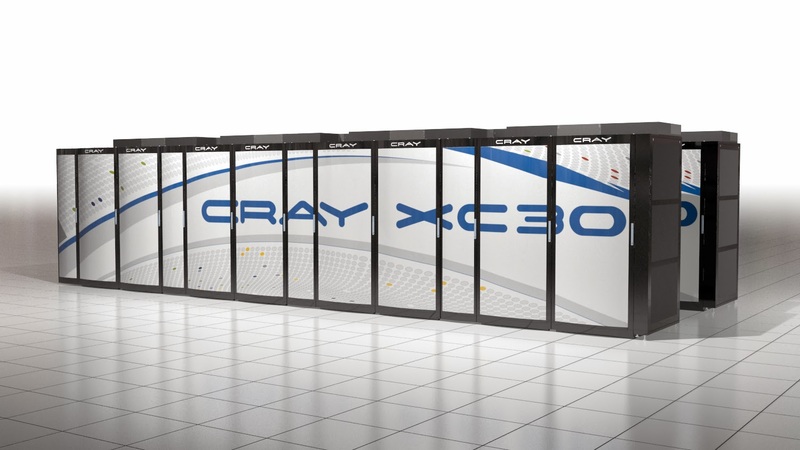 In contrast, the European Center has just acquired TWO U.S.-made CRAY XC-30 computers, each with 80,000 processors. 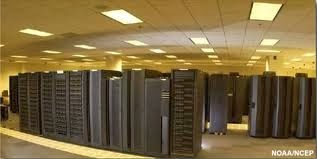 My sources indicate that each EC computer has a peak throughput of 2-5 petaflops and a sustained 200 teraflop capability, dwarfing the computers the NWS has today. Translation: the new European Center computer is approximately 15 times faster than the current National Weather Service computer. And our computer has to do FAR more tasks. The funds from the Sandy supplemental funding would be enough to secure a computer from IBM with a peak performance of 2 petaflops, substantially less than the European Center computer. And keep in mind that the European Center only has to do global weather prediction while the National Weather Service has vastly more modeling responsibilities, including high-resolution forecasting over a vast nation. The U.S. really needs a 20-30 petaflop computer resource to provide U.S. citizens with state-of-the-art weather forecasting. Such machines exist and are being used for climate prediction and simulations of nuclear explosions....do we have our priorities wrong? 1. The U.S. global model, the GFS runs with 26 km grid spacing, while the EC is at 16 km, and they plan to go to 10 km very soon. 2. The U.S. does not have the computer power to run high-resolution ensembles (many forecasts) over the U.S., a necessity for prediction of thunderstorms and other local weather features. 3. The U.S. has lagged substantially in the area of data assimilation, the technology of effectively using observations to describe the structure of the atmosphere...the starting point of all numerical weather predictions. 4. The U.S.lacks the computer power for high-resolution global ensembles, which are critical for prediction of uncertainty and probabilities. Such ensembles are also critically needed for weather data assimilation. The effective use of a large computer system, like the European Center has, would greatly improve U.S. weather prediction, clearly saving lives and promoting the economic needs of the U.S. (e.g., agriculture, water resources, renewable energy). U.S. companies now spend many millions of dollars to get the European Center model forecasts; they would not need to do so if the U.S. predictions were the best. With such an acute need for enhanced computer power, you would think the U.S. government would have initiated the acquisition of new weather supercomputers immediately and just as quickly begin testing the improved weather forecasting models that would move to the new system. If you thought that, you would be wrong. Today, a year after the funds became available a new NWS supercomputer has not been ordered. The reason given? 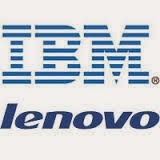 IBM's sale of its server division to Lenovo. It turns out that NOAA made a very bad decision in their computer acquisitions. They committed themselves for an extended period to buy only from IBM, thus losing the ability to shop around for the best deal during each replacement cycle. And now IBM is planning to sell its server business to Lenovo, a Chinese company, and this is setting off all sorts of warning bells in the U.S. government, and specifically for the new weather computer acquisition. If NOAA was not stuck with IBM they could go with other vendors, like CRAY, which sells U.S. machines that have no security issues (in fact, the European Center liked them so much they bought one!). The worry about the Chinese server business is particularly ridiculous for a weather forecasting computer. Does the U.S. government think the Chinese will turn off U.S. weather prediction in case of a conflict? Even if they could do that, it would make little sense. Many Chinese groups download and use the use U.S. GFS weather model output. If they somehow turned off our weather forecasts, we would always have the European Center, the Canadian model , the UKMET office model , and the forecasts from the U.S. Navy! So it would not get them anything. And there is something else you might not know of. A huge proportion of the U.S. modeling community hails from China. I do a lot of numerical modeling, and when I go to conferences and attend sessions on topics like weather data assimilation, it is evident that if the presenters changed language to Mandarin, the majority of the audience would be quite content. China and the U.S. have a close partnership in weather prediction with profound interdependence. They are not going to destroy our weather modeling capability. And this far fetched threat should be balanced against a real threat. In fact, not a threat, but a reality: the inferiority of U.S. weather prediction, the cost of which is very real to each U.S. citizen. There is all kinds of talk about extreme weather and climate change, yet we don't do the one thing that is guaranteed to afford substantial protection for our population from extreme weather: better weather prediction. A year ago, high NOAA and NWS administrators were flashing powerpoints with time lines showing that the new NWS supercomputer coming online during the second quarter of 2014. Their latest presentations say nothing about upgrades during the next few years and talk about what they will be doing in 2018! And there is NO sign of an active process of designing and testing the next generation models that could immediately be used on a far more capable supercomputer. Just a continuation of the go slow approach that has kept U.S. weather prediction mired in the mud for so many years. Recently, there have some changes in NWS leadership, with a particularly capable individual becoming head of NCEP (National Centers for Environmental Prediction). There are some very capable modelers/scientists in NOAA/NWS. But they need sufficient computer resources and they don't have them now. And there is an acute need for a detailed strategic plan on how the U.S. will regain leadership in weather prediction...which they don't have. It is time for Congress or the administration to end the foolishness with the computer contract, or to void the IBM contract and find another vendor. An interesting possibility is for IBM to purchase a CRAY XC-30 and use that for the NOAA/NWS contract. The European Center folks are just loving the stalled U.S. weather prediction effort. As noted above, they are making out like bandits selling their model forecasts to U.S. and other countries...we are talking about many millions of dollars. And I understand that European Center staff bonuses are partly based on how much they are ahead of the U.S. So the current situation is like money in their pockets. A year ago, I was at a meeting where I had a chat with the head of the European Center. He had seen my blogs and told me that the U.S. should not worry about leading weather prediction since we were all in this together...or something like that. Right. Keep in mind that the European Center is never going to take care of most of the U.S. numerical weather prediction needs, like high-resolution national ensembles for thunderstorm prediction. And the money is rolling in for them as long as the U.S. is behind. 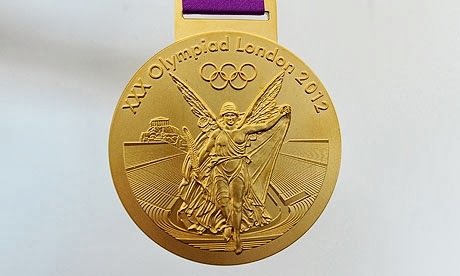 Why Not Strive for the Gold? satisfied with bronze status, particularly when it costs the American people dearly in lost lives, injuries, and a multitude of economic costs? How long will the political leadership of our country accept this situation? 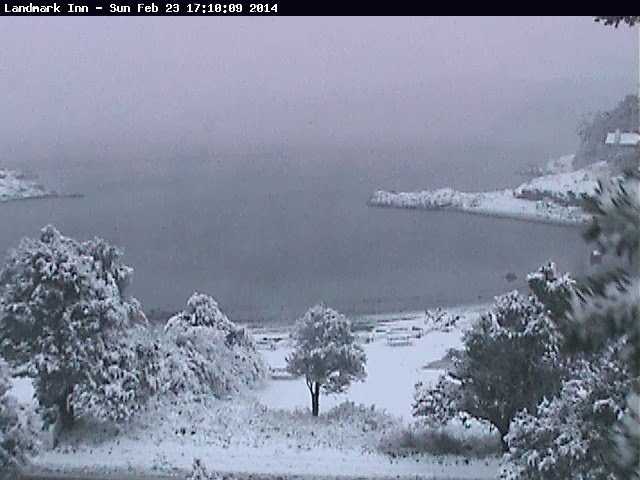 Bellingham and Environs are Buried in Snow! Announcement: The Northwest Weather Workshop will be on Feb 28th/March 1st in Seattle. Bellingham and parts of northwest Washington are getting hammered with large amounts of snow today, with totals of 6-12 inches being typical. 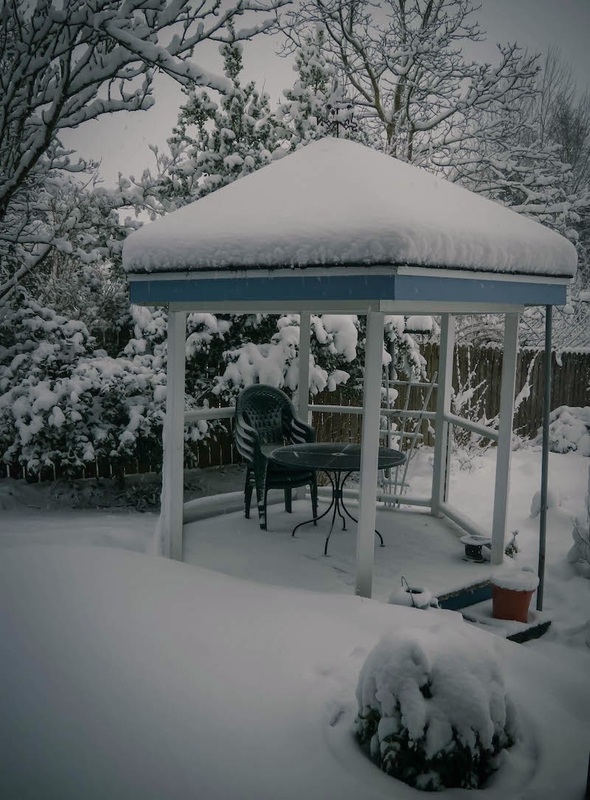 Here is a picture I just received from RG Stout near the Bellingham Airport, where there is already about 8 inches already on the ground. 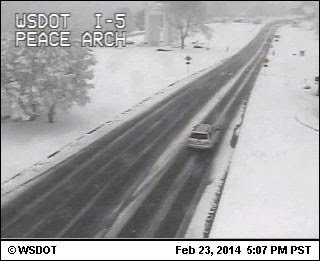 Or check out some of the WSDOT cams from the Peace Arch at the Canadian border down to Bellingham. Enough to make you want to buy a pair of chains. We knew this was coming....as I have shown you for a several days, the high-resolution models were emphatic about the snow potential over NW Washington. The reason? A battle between cool, dry northeasterly flow coming out of the Fraser River Gap and warmer, moisture southerly/southwesterly winds pushing from the south as a warm front approaches. Here are the local surface observations around 4 PM. Temperature is shown in red, dew point by the blue numbers on the lower left of the circles. S means snow. You can see the northeasterly winds pushing out of the Fraser and extending southwestward to the Olympic Peninsula. SNOWFALL IN PAST 11 HOURS. STILL SNOWING HEAVILY. TOTAL SNOWFALL SO FAR. 3 INCHES FELL IN PAST 3 HOURS. STILL SNOWING HEAVILY. ELEVATION 30 FEET. ESTIMATED SNOWFALL MEASUREMENT SINCE 745 AM SATURDAY. SOME BLOWING OF THE SNOW. The cold air has been pushing south...but things will change tonight/tomorrow am as the air warms, precipitation fades, and downslope flow (easterlies) develop over Cascades. No school in Bellingham tomorrow, but south of Mt. Vernon, life will be normal. Sorry kids. Each model run during the past few days has been warmer and less snowy over Seattle and vicinity. The latest runs tonight are consistent with that trend and have no snow over Puget Sound tomorrow or Monday. 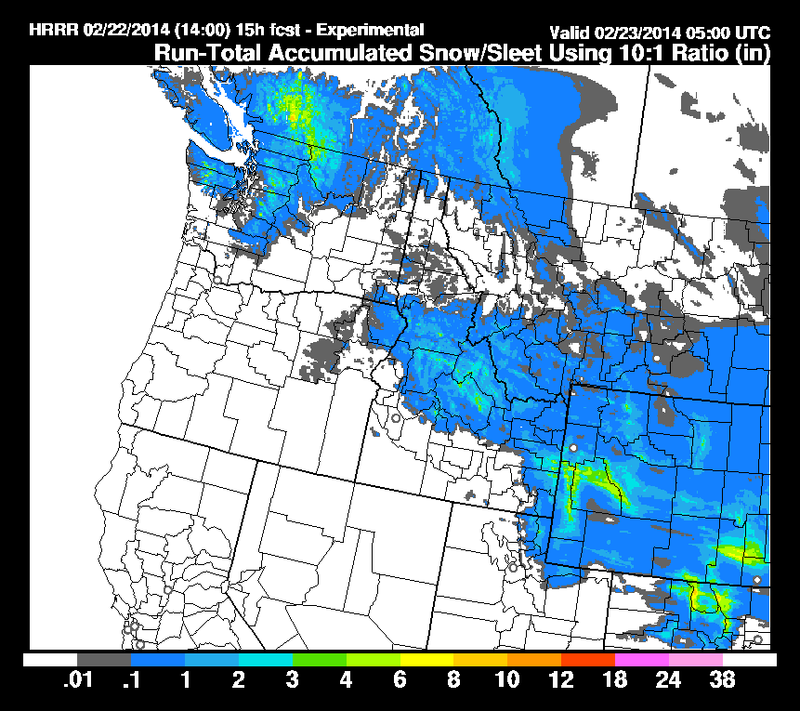 Here is the latest UW WRF snowfall for the 24 h period ending 4 PM Sunday. 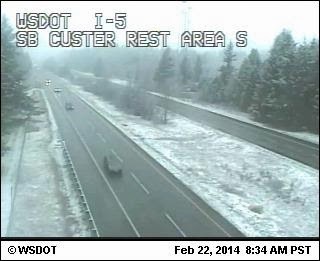 Everett to Olympia is snow free. But it still looks like there will continue to be snow around Bellingham, where it has been snowing for hours on Saturday. The NOAA Rapid Refresh model is consistent with the UW WRF run, as is the European Center global model. The next 24 hours? Same story, but with less precipitation. The Cascades will get some additional snow pack, ranging from 6-12 inches during the next 48h. For those trying to plan your weekend, let me give you a brief update. Yesterday's forecast is working out fairly well: light snow is falling over portions of Whatcom and Island counties, with light rain extending over the central Sound. 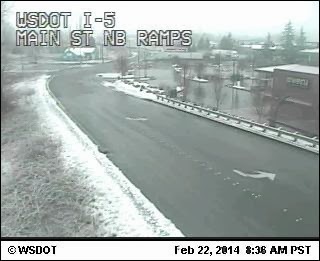 Here are some of the latest WSDOT cams around Bellingham and Blaine. With warm roads and light snow, the roads look fine. Both the UW WRF model and the NOAA Rapid Refresh suggest that Seattle and other locations near the Sound will not get any real snow (a few flakes mixed in at most at sea level). Perhaps some light snow (quarter to an inch) on the very highest hills. Here is the latest Rapid Refresh total accumulations through two times: 1 PM Saturday and 9 PM tonight (click to make bigger). The mountains will get several inches to perhaps a half foot. The big threat will come Sunday night/Monday morning as cooler air moves back into the region and a warm front approaches. Unfortunately, for Seattle snow lovers, this air is still marginal for snow over the central Sound southward. 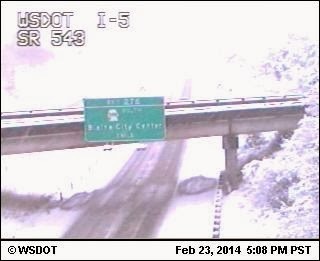 Northwest Washington is a different story...they will get snow...so if you are in Bellingham, be prepared! Here is the latest predicted snowfall totals for the 24h period ending 4 AM Monday. Up to a foot in the Cascades, light snow from Seattle northward, on the Kitsap Peninsula, and on the northern Olympic Peninsula (which may interrupt the golf in Sequim on Monday). With temperature on the edge for rain versus snow, there would be more snow on the top of Seattle's hills. 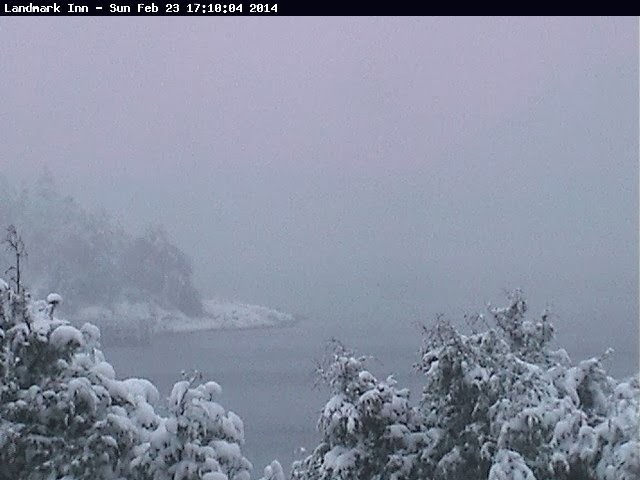 But the snow over the Sound lowlands will be light. Keep in mind that only a slight change in temperature and precipitation intensity could shift the snow boundary north or south. And another thing to consider: each model run cycle has reduced the threat of this snow event. Meteorologists call this dprog/dt or dmodel/dt (those who know some calculus will understand the name!). In any case, there is uncertainty in any forecast, particularly with snow predictions. Lowland Snow over Washington this Weekend? Some forecasts are very hard and this is one of them. The lowlands of western Washington have two shots at snow: Saturday morning/early afternoon and Sunday afternoon/evening/Monday AM. The several weather forecasting models we have available are not in agreement on snow amounts and distributions, with temperatures being right on the edge for rain versus snow. I am going to give my best shot at this, but it is important to check the forecasts often, since the situation should clarify as we get closer to the events. So we will have precipitation. Temperature will be the key issue. Looking at a number of models, it appear that there will be a distinct north-south temperature gradient--cooler to the north. As a result it looks like Bellingham and Whatcom County will see a few inches of snow and south of Seattle it will be rain near sea level. Seattle might see some wet snow initially over the higher hills, but precipitation will turn to rain during the afternoon. 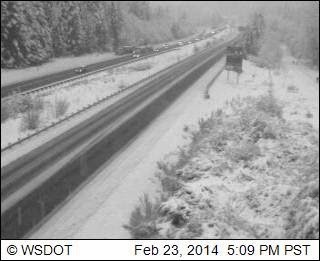 Better chance of light snow from Lynnwood northward. 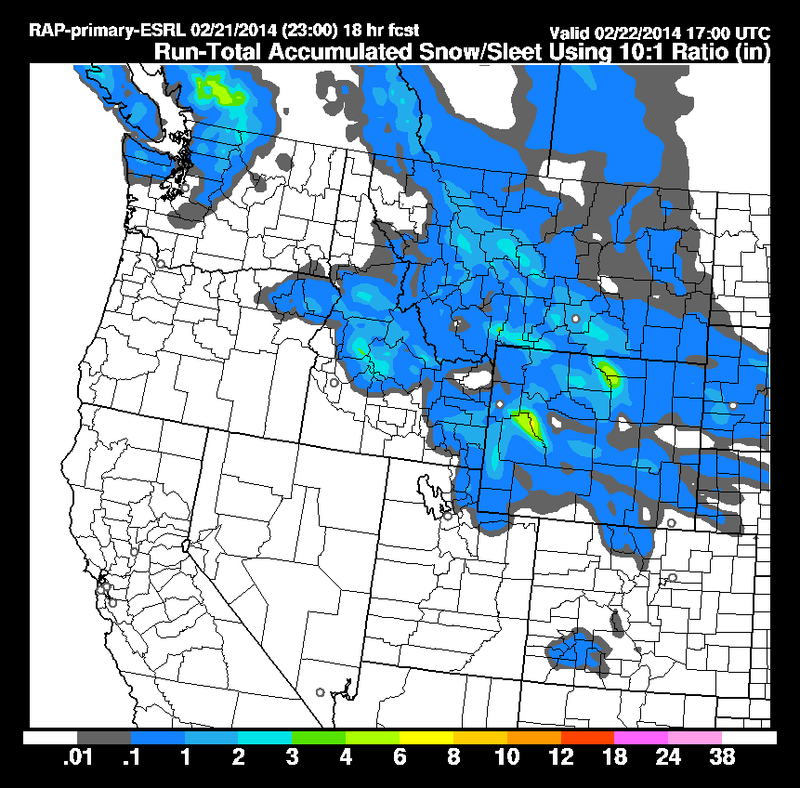 Here is the accumulated snowfall ending 9 AM from the latest NOAA Rapid Refresh model run. No snow in Seattle...but light stuff over Snohomish County northward. 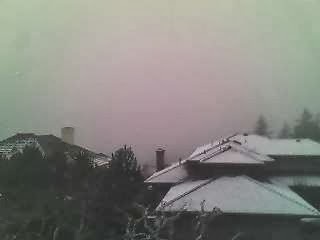 The mountains are guaranteed snow..up to around a foot in the central Cascades. The bigger issue is Sunday. As the Saturday disturbance passes through, colder air will return to the lowlands on Sunday AM. At the same time, a warm front (with plenty of precipitation) is approaching, with precipitation reaching western Washington late Sunday afternoon. With low pressure with the warm front and higher pressure over BC, cold air will push southward, particularly through the Fraser River Gap (see figure). Here is the regional sea level pressure and temperature UW WRF forecast for 7 PM Sunday. Blue indicates cold temps, yellow warm temps. Here is a close up view of the forecast at 10 PM Sunday...cold air and northerly flow over the Sound...cold enough for snow. And here is the three-hour snow forecast ending 10 PM Sunday...light snow over much of the region. The problem is that some models...like the gold standard European Center model...are a bit warmer, resulting in no snow near sea level on Sunday. Folks...we are right on the edge and small differences in the model solution will make all the difference in rain versus snow. Large uncertainty. We will be watching the models and observations over the weekend...and hopefully the forecast will become more definitive in time. My gut feeling is that Sunday night/Monday morning will whiten up the Seattle area...but we will see. The Terrifying Turbulent Flight of United 1676: Why did it happen? United Flight 1676, en route from Denver to Billings Montana, were cruising at 34,000 ft above Wyoming around 3 PM Mountain Standard Time (MST) Monday when the severe turbulence hit the plane. Passenger heard a loud boom, the Boeing 737 aircraft tilted to the right and plummeted downward for several seconds. Unbelted passengers and crew hit the ceiling, a baby was pulled form a parent's arm, and several passengers were seriously injured, one critically. No warning was given prior to the encounter and the plane landed in Billings less than a half hour later. Why did this incident occur? Is their any way to avoid such serious events? Such are the topics to be explored in this blog. According to FlightAware, the aircraft left Denver at 12:12 PM MST and landed in Billings at 1:25 PM MST. The route crossed Wyoming from the SE to NW and no thunderstorms were evident on the radar (see image). This flight track took the aircraft over the terrain of the Bighorn National Forecast and east of the more substantial terrain surrounding Yellowstone National Park (see graphic). 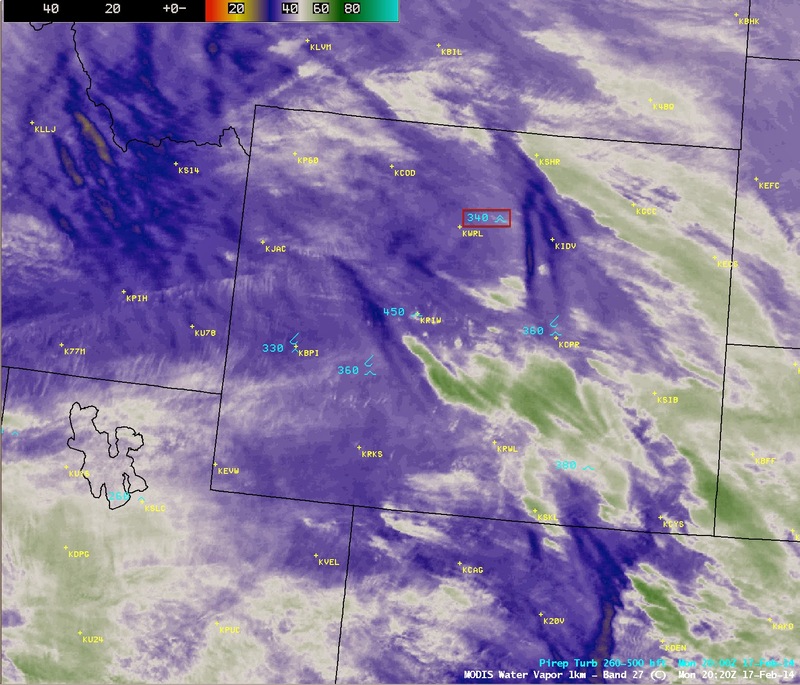 The severe turbulence hit the plane around 1 PM MST (3 PM EST) when the aircraft was over northern Wyoming. Around this period the plane experienced a sudden loss of speed and a drop in altitude (see plot from FlightAware below). TB SEV means severe turbulence. Altitudes between 34,000 and 38,000 ft. Since there were no thunderstorms in the area, the number one candidate for producing this turbulence was high amplitude breaking mountain waves. High amplitude mountain waves occur when strong winds approach mountain accompanied by the proper changes of stability (related to temperature) and wind with height. 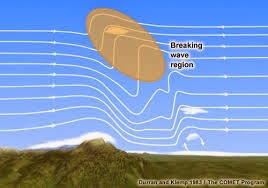 Such waves can amplify to the point that they break, producing severe to extreme turbulence (see figure below). 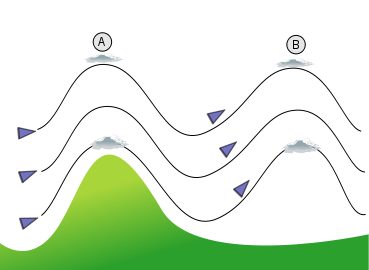 The turbulence from breaking mountain waves can be highly localized in altitude and position, with change of only a few thousand feet or a few miles, taking an aircraft from extreme turbulence to a smooth ride. Turbulence can also be highly transient, developing or disappearing over a few minutes or an hour. Let's check model forecasts for this time to see whether they predicted such mountain waves. Here is the UW WRF forecast (12-km domain, 7hr forecast) for noon MST showing the winds and vertical motions (colors) at 500 hPa (around 18,000 ft). You see the strongly varying colors over Wyoming?,with alternating bands (red to blue) --those are couplets of upward and downward motion associated with high amplitude mountain waves. 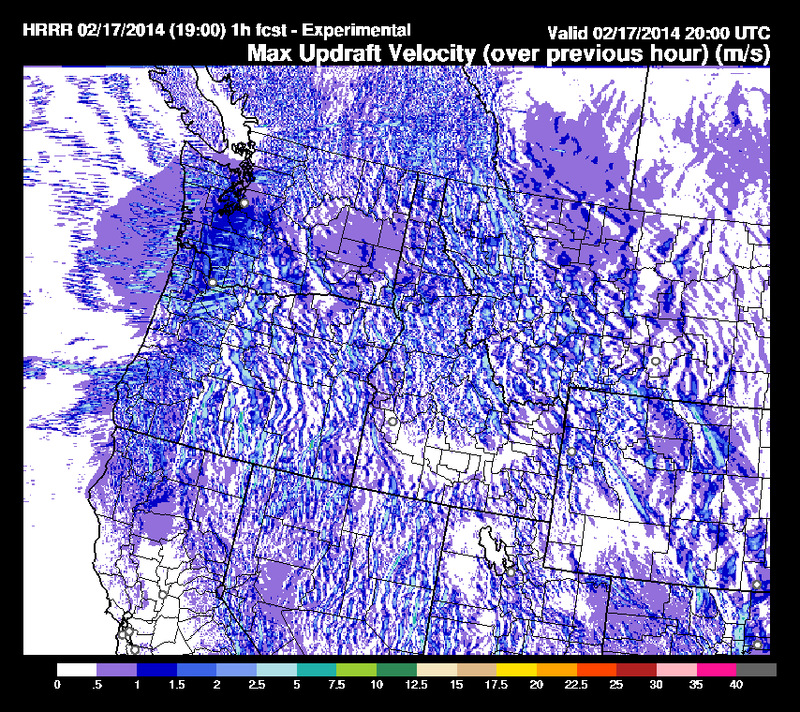 And take a look at the 1 hr forecast for maximum updraft velocity in the vertical air column for the same time from the NOAA/NWS HRRR model (3 km resolution). You see the light blue band over north central Wyoming. The HRRR had the mountains waves as well. And now another tool: high-resolution MODIS satellite water vapor image provided the University of Wisconsin (CIMSS). Where the air is descending there is less water vapor (dark purple), rising--more water vapor (lighter colors). You see the striations near the Bighorm Mountains....that is probably the signature of the mountain waves. The National Transportation Safety Board, the FAA, and United Airlines will undoubtedly be investigating this turbulence event in more detail, but it sure looks like the result of the plane heading into a breaking high-amplitude mountain wave. As our forecast models continue to our improve and satellite imagery gets more sophisticated, perhaps one-day aircraft will preemptively avoid such locations. If you really don't want to risk getting into such situations, by watching the models and cancelling flights on days with strong mountain wave activity you would escape most of them. The lee (eastern) side of the Rockies is notorious for mountain waves, so avoid airports like Denver and Billings if you really dislike mountain wave turbulence. 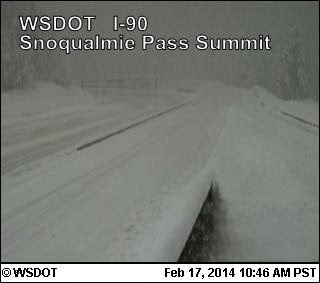 Snoqualmie Pass is closed. The road to Paradise (Mt. Rainier) is closed. The avalanche danger is great. Massive snows have hit the Washington Cascades. 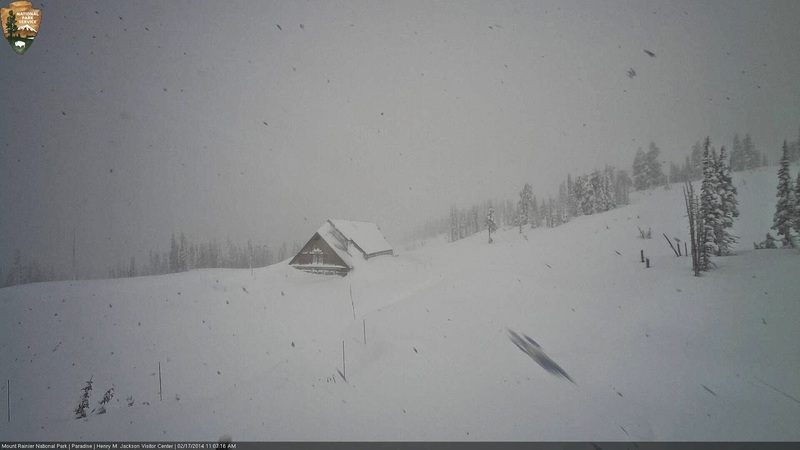 Here are the webcams from Snoqualmie Pass and the visitor center at Paradise. As stated in Sharkado: "nuff said." The present storm has dropped approximately two feet in the Washington Cascades...and it is not over yet. Take a look at the snow accumulation graphs (from the NW Avalanche Center) at Snoqualmie, Stevens, and Baker from Feb 8th to today (Feb. 17th). Over that period the snow depth has doubled at Snoqualmie and increased by about 50% at Stevens and Baker. As mentioned above, the snow is not over. The latest visible satellite photo shows the mountains covered with clouds and a collection of instability showers moving in off the Pacific. Winds are westerly aloft, which produces maximum uplift on the generally north-south oriented Washington Cascades. Paradoxically, such westerly flow produce precipitation shadowing to the lee (east) of the Olympics and Cascades as downslope flow causes drying and evaporation of clouds. So we are getting some filtered sunshine in Seattle while the mountains are getting hammered. 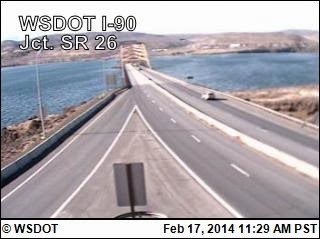 And it is positively sunny in places in eastern Washington like Vantage (see image). 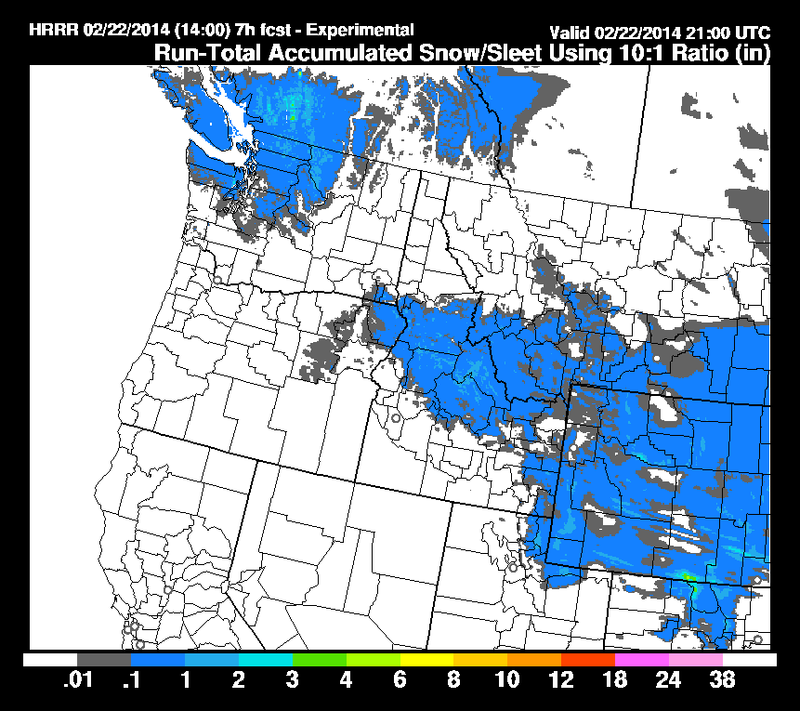 Here is the latest UW WRF forecast for snowfall over the next 48 hr. Another few feet in the Cascades, Coast Mountains of BC, and the Olympics. We are on track to have a normal mountain snow pack by the end of the week! Finally, so we get 2-3 feet of snow, with new snow totals of 3-8 feet this week, and we are being IGNORED by the Weather Channel. Now I love the WC, but isn't our snow as good as the snow back East? They get a foot and the WC has all kinds of dedicated coverage with Jim Cantore and others. We get 5 times more and are ignored. A minor snowstorm in the East gets a name (REX for the current one, see below), WE don't get a named storm, even if the end of the world occurs. We gained some respect in the SuperBowl, perhaps we should apply some of that 12-th man spirit and name are own storms...perhaps with appropriate Native American appellations. Why should some folks in Atlanta, where they don't know snow from Adam, decide on what we call things in the Great Northwest?